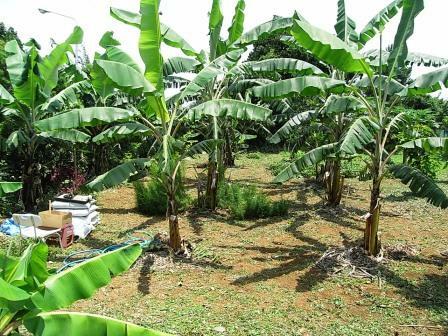 I remember an article about banana in July 16, 2006 issue of our newsletter, entitled “Banana: The Healing Fruit of the Tropics”. Since then, we continuously receive so much vital information from our valuable newsletter subscribers. Banana is really one of the most natural remedial fruit for many ailments. There are some popular proverbs saying, “An apple a day, keeps the doctor away”, and “A single bulb of garlic a day, keep diseases away”. However, banana seems to be superior in terms of nutritional value. Compared to an apple, banana has four times more protein, twice the carbohydrates, three times more phosphorus, five times the vitamin A and iron, plus many other minerals and vitamins. It also has natural sugars such as sucrose, fructose, and glucose with fiber. Therefore, it can give sustained and substantial amount of energy levels, too. Banana is not just an energy-giving fruit, but it prevents a number of illnesses and conditions that makes it a desirable add-on to your daily diet. Some researchers claim that eating bananas regularly can reduce the risk of stroke by as much as 50%. Wow, that's great. It may be the reason that I do not suffer from heart problems. Banana is extremely high in potassium, which is a great element in controlling blood pressure. Potassium is also important for brain functions. Research shows that regular consumption of banana during breakfast and snack increases our memory capacity. 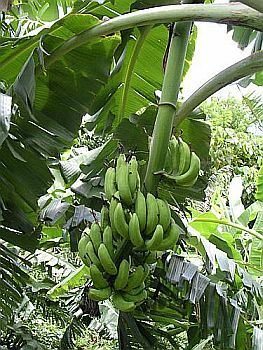 I take a lot of banana every day, since we have hundreds of banana plants in my farm and backyard garden. Is it the reason that I am a bright? Ha-ha-ha. Depression. Banana contains “tryptophan” that helps the body to produce serotonin—which has a calming effect on the brain that makes you feel relaxed and calm. It can also help people suffering from “Seasonal Affective Disorder” or “Winter Depression”. Depressive symptoms can be reduced by just eating banana. Can you believe that? Constipation. Banana in your diet can help restore normal bowel movement. Premenstrual syndrome (PMT). Don't take supplemental drugs, just take banana. Banana is full of vitamin B6, which can regulate blood sugar levels, and helps normalize premenstrual syndrome. Stress. When we are stressed, our metabolic rate rises, thereby reducing potassium levels. Potassium plays a big role in normalizing the heartbeat and oxygen to the brain, and in regulating water fluid in the body. Thus, potassium taken from banana can help rebalance these problems. Anemia. Banana is high in iron, which can stimulate the production of hemoglobin in the blood and prevent anemia. Hangover. One of the easiest ways to relieve from hangover symptoms is to make a banana milk shake, sweetened with honey. The banana calms the stomach and, with a drop of honey, builds up depleted blood sugar levels, while the milk soothes and rehydrates your system. Smoking. It is hard for chain-smokers to stop smoking. When you stop and give up smoking, try the banana diet. Vitamin B6 and B12 as well as potassium and magnesium contents of banana can help the body recover from bad effects of nicotine withdrawal. Heartburn. Banana has a natural antacid effect in the body, thus eating banana can sooth and relieves heartburn. Morning Sickness. Snack on banana between every meal. This will help keep blood sugar levels up and prevent morning sickness. Ulcer. 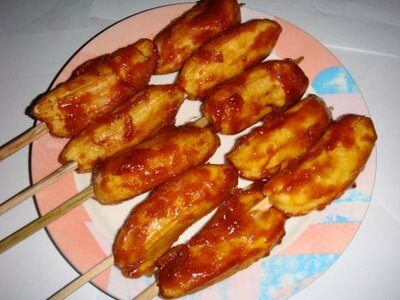 Banana is served for ulcer patients in many hospitals. It is because of its soft texture and smoothness that makes it good for intestinal disorders. Banana can neutralize over-acidity and reduces irritation by means of coating the lining of the stomach. Temperature Control. Banana can lower both the physical and emotional temperature of the body. In fact, in tropical countries, some doctors recommend pregnant women to eat bananas to make sure their baby is born with a cool temperature. Insect Bites. Rub the affected area with the inside of the banana peel to reduce swelling and irritation. There are over 1000 types of bananas in the world, according to knowledge books. They differ slightly in appearance, size, taste, and use. Dessert bananas can be eaten as is, and the other kind need to be cooked. 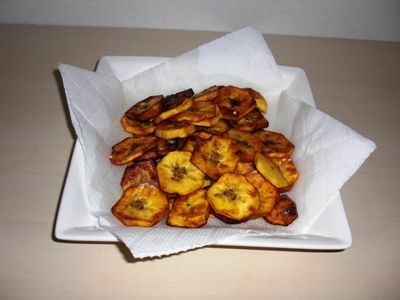 Cooked banana are usually rich in nutrients. 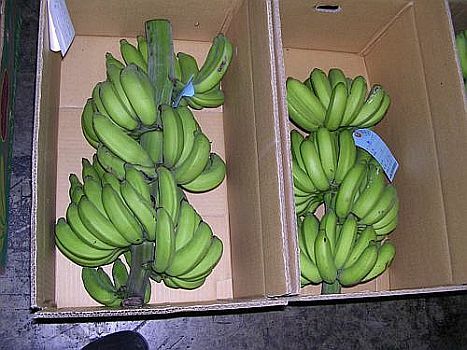 We have both kinds of bananas in our farm. 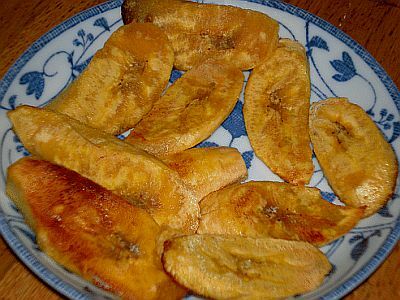 We cook banana soup, fried banana, and bake banana bread and banana cakes. You can cook any kind of bananas you can find in the store, and even make cakes. Your kids will surely enjoy it. These are all easy to make. Just cut the banana and fry with high temperature oil. Add sugar, or honey or chocolate, to add to your taste! You can also mash the banana to make a paste, then mix with flour and bake as bread or cake as you desire.